Just west of Cass Avenue in Westmont, Illinois. Find directions to Westmont Yard. Active Childcare is located on the mezzanine level of Westmont Yard. Active Childcare is a full service Daycare Center and Preschool where parents can leave their children for the whole day or half a day. We have a video compilation of some of the kids Here. We are committed to providing your child with a safe and nurturing environment in which they will be able to learn and play. We offer a bright and cheerful infant room where infants follow individualized meal and rest schedules. During the day, our teachers incorporate language development, practice fine and large motor skills, hand/eye coordination, social development, and infant massages. Our two year old program is based on a weekly thematic unit that allows your child to develop socially, emotionally and physically. We offer a schedule that allows for small and large group time as well as individual time for your adventurous two year old. Our teachers will fill the day with activities in language, music, arts and crafts, sensory exploration, and dramatic play. Our Pre-Kindergarten program is designed to prepare your child for Kindergarten. The Pre-Kindergarten program emphasizes activities that support your child’s social, physical, emotional, and intellectual development as a whole. Our teachers have large group times, yet encourage individual growth as well. Your child will learn new math concepts, begin journaling, get excited over new science discoveries, create new arts and crafts, or begin to read a new book. They will use the computer, play on the indoor soccer field, build with blocks, or play on the 5-level play structure. During the day, your child’s teacher will bring their class down for large motor time on our 5-level play structure. During the day, your child will have access to Westmont Yard, an Indoor Sports Facility which features a 60yd X 90yd state-of-the-art athletic field. Your child will never have to worry about the weather being too cold for outdoor play. We have the benefit of both indoor and outdoor playgrounds filled with a generous amount of equipment. Westmont Yard offers Mighty Tykes classes and by enrolling in Active Childcare, you will be entitled to a discounted rate. Mighty Tykes is a unique child-focused development program that focuses on fun. 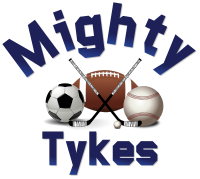 Mighty Tykes offers a variety of programs and sports. Email Josann Miller, or call (630) 737-1110. Serving Chicago's Southwest Suburbs, including Westmont, Downers Grove, Darien, Hinsdale, Oakbrook, Western Springs, & Woodridge, Illinois.